You will need the Laravel CLI installed on your machine. This tutorial uses Laravel 5.7. You will also need SQLite, and a basic knowledge of Laravel and PHP. When using certain applications, it is usually expected that the current user is able to see all other users currently using the service alongside them. For instance, Dropbox Paper shows all the users that are currently viewing a document. This is very useful and it helps stop users feeling like they are alone on your application. In this tutorial, we are going to see how you can add online presence reporting to a Laravel application. To showcase this, we will be building an application where users can log in and leave quick updates on anything they want. Each online user will be able to see the list of logged in users. Laravel CLI installed on your machine. Installation guide. Node.js installed on your machine. Download the latest stable version here. SQLite (v3.x or later) installed on your machine. Installation guide. If you have the listed requirements, we can continue. Above, we have added two new Sass files, signin.scss and updates.scss. In these files, we will be adding specific CSS for the sign in page and the updates page. Create these files in the resources/sass directory and leave them empty. The watch script keeps the command line occupied. It automatically watches for changes to your assets and builds automatically when it detects changes. This is better than running the build script every time you make changes. For this tutorial, we will be using an SQLite database. It is easy to set up and is a good database engine for small projects. If you are building bigger projects though, you should use MySQL. The actual change we have from the previous code is the introduction of the avatar field. We will use this field to store URL to the avatar of the user. Above, we have the migration for the updates table. It has the user_id field which it’ll store the user ID of the user that made the update, and the text field that stores the update made. Now that we have defined the table structure using our migration files, let’s update the model for our tables. We added the avatar field to the fillable array. We added the updates method, which is for the relationship between the User and the Update. In this case, a user can have many updates, but an update can only belong to a user. Above, we have a typical Laravel model. The user method is the relationship link from the Update model to the User model. Above, we have a model factory. When the factory is called to generate a user, the callback above is called and it returns a unique array of fields to be used when creating the sample user. The factory uses the Faker library for this. For the avatar, we are using a photo from the randomuser.me website. The factory essentially does the same as the previous factory, only for the Update model. Above, we have added the logic for the seeder. It will generate ten users using the UserFactory, and for each of the users, it will generate an update using the UpdateFactory. So basically, when the seeder is run, we will have ten dummy users with ten dummy posts. You can always run the command above to clear changes to the database. It will delete all the tables and run the migration and seed command from scratch. Now we are done with the database set up. Let’s start building the application. First, let’s add a login page. We will be using the / route as the login page and we will not need the artisan make:auth command that comes default with Laravel. GET /logout - this will log a user out of the application. It uses the LoginController that comes default with Laravel. We don’t need to do anything more. POST / - this will handle logging in. It also uses the LoginController and we do not need to do anything but send a POST request to it with the email and password field. 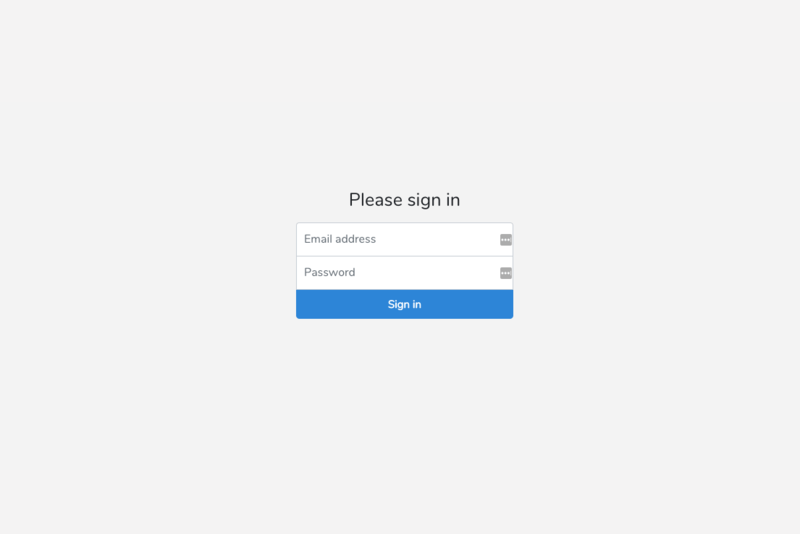 GET / - this will display the login page. It uses a guest middleware that comes with Laravel by default. This will redirect all logged in users away from the page to the dashboard. Above, we have the HTML for the sign in page. In the head it is referencing the signin.css file, which at this point is empty. So let’s add the style for this page. Above, we have the style for the sign in page. Because we have the npm run watch command still running, the Sass file will be automatically compiled. In your browser, visit the URL http://localhost:8000/ and you should see the login screen. Great. Now quit the serve command by pressing ctrl + c on your keyboard. Let’s create the updates page. GET /home - this will be the page where all the updates will be displayed. GET /updates - this will be an API endpoint that we will load from the /home route. It will return a JSON response of all the updates. POST /updates - this will be an API endpoint that we will use to add new updates. It will return a JSON response of the new update. GET /updates/suggestions - this will be an API endpoint that will return a JSON response of random users. Not really important, it’s just for aesthetics. __construct - in here we add the auth middleware so that only authenticated users can visit any of the pages in this controller. index - the updates page. create - creates a new update, sends a broadcast to Pusher, and returns a JSON response. list - returns a JSON response with the latest updates. userSuggestions - returns a JSON response with random users. For now, we will leave the generated class and move on. It references the updates.css style, which we have not yet created. It has three Vue components referenced, OnlineList, Updates, and Suggestions, which we have not created. Above, we have the style for the updates page. Because we have the npm run watch command still running, the Sass file will be automatically compiled. Above, we imported Axios, which we will use for HTTP requests, we also registered the Vue components we created earlier. In the script we load the updates in the mounted method. In the template we loop through all the updates and display each. We also have a form that we can use to post a new update. When submitted, this form calls the addUpdate function in the methods property. Just like the Updates component, we have the template and script tag. The script loads the suggested users and the template loops over the users and displays them. Like the components before it, the OnlineList component has the template that loops through the data and the script that loads the data. We have not yet implemented the who’s online feature so, in the mounted method, we just add the current user as the only online user. We will add the presence and realtime feature in the next section. Let’s start from the Laravel PHP side. We will first activate the broadcasting feature, then we will update the configuration in our .env file, after which we will update the event file we created earlier. Next, open the .env file and change the BROADCAST_DRIVER from log to pusher. Finally, in the same file, update the keys below with the keys from your Pusher dashboard. Above, we have a Laravel event class. Notably, we have the broadcastsOn method which defines the channel we want to broadcast this event on. In this case, we are using a private channel called updates. Note that we are implementing the ShouldBroadcast interface. If we don’t, the event will not be broadcasted to our Pusher instance. Because our channels are private, presence is private by default, we have to define the authentication logic. The first one checks if the current user is logged in. Only logged in users can listen in on the updates channel. The second checks to see if the user can listen on the online presence channel. Unlike the first, the presence channel does not return a boolean. It returns details of the user if the user is authorized. This will make Laravel Echo available to us. We will use this library to interact with Pusher. Above, we are using Laravel Echo to listen for the UpdateCreated event on the updates channel. Every time a new update is added, the event above will be triggered and the callback inside the listen method will be invoked. In the callback, we add the update to the top of the updates array. Because Vue is reactive, the data will be updated instantly on the UI. here - this returns all the users currently in this presence channel. In the callback, we set the users array to the response. joining - this is called when a new user comes online. In the callback, we simply push the new user to the users array. leaving - this is called when a user disconnects or goes offline. In the callback, we filter out the user that disconnected from the users array. That’s all. Now let’s test our application to see it in action. To test the application, we need two accounts that we can log into. You can check the users table in the SQLite database but there is an easier way to get the users. This will give us the emails of two random users. We can use these email addresses to log in as the demo users. The password is secret for all the demo users. In this tutorial, we have seen how easy it is to work with presence channels on a Laravel application.